"Never speak, on my behalf, about my business, again." This menacing quote is said by Jennifer Lawrence in Joy, one of the best & most underrated films of the year. The film is based on the true story of Joy Mangano, an Italian-American woman from New York who rose from bankruptcy & debt to success as a self-made millionaire, who created such things as the Miracle Mop. Lawrence plays Mangano, a divorced mother of 2 children, & they live in a rickety house on Long Island with her divorced parents: her soap opera addict mother Carrie (played by Virginia Madsen) & her twice divorced father Rudy (played by Robert De Niro); her grandmother Mimi (played by Diane Ladd); & her lounge singer ex-husband Tony Miranne (played by Edgar Ramirez). Also involved are Joy's half-sister Peggy (played by Elisabeth Röhm), & her best friend Jackie (played by Dascha Polanco). One day, Joy creates a new, state-of-the-art mop with her daughter. She then has her dad's new girlfriend Trudy (played by Isabella Rosselini) give her money to start it up. However, Joy can't sell any mops, until she meets QVC executive Neil Walker (played by Bradley Cooper). He gives Joy a shot on television, & after a QVC salesman fails to sell any mops, Joy decides to sell them herself on QVC, & she becomes an instant success, eventually setting up an assembly line of mops in her father's old shop. Along the way, she encounters bankruptcy, debt, sketchy manufacturers & Trudy's mogul-like demands, along with the fact that her house is falling apart. Eventually, she rises past all of this, & rises up to become a big success, even though Rudy, Trudy, & Peggy unsuccessfully sued her for control of the company to try & get her money, eventually becoming great friends with her ex-husband, & also becoming amazing friends with Neil. The film was excellent. Jennifer Lawrence, as always, was AMAZINGLY SPECTACULARLY AWESOME, & she is one of the best actresses out there today. The acting from Robert De Niro & Diane Ladd was also spectacular. 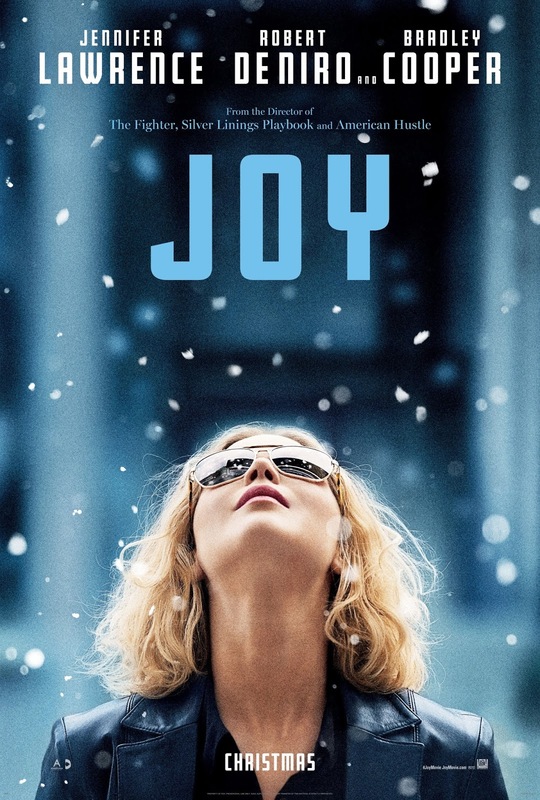 The direction from David O. Russell was excellent. The screenplay from Annie Mumolo & David O. Russell was also excellent. This is definitely one of the best films of the year.